A forest, by its very nature, is very old. The largest trees may have grown in the same spot for more than a century. The Earth around these trees has been disturbed very little over the years, allowing a complex colony of fungi, bacteria, insects, worms, snails, reptiles, and even small mammals to live peacefully among the roots of the trees. A wise gardener tends the garden while disrupting these ancient communities as little as possible. The roto-tiller has no place in a forest garden. Gardening is done more around the edges of things than in rows; either with individual plants tucked into their own planting holes, or raised beds constructed on top of the existing soil. In a forest garden, the roots of existing trees and shrubs fill the soil in their own lacy network. Every attempt to dig will be met with resistance. Every new hole must be carved out between existing roots, or the roots running through that hole must be sacrificed to make room for the new addition. 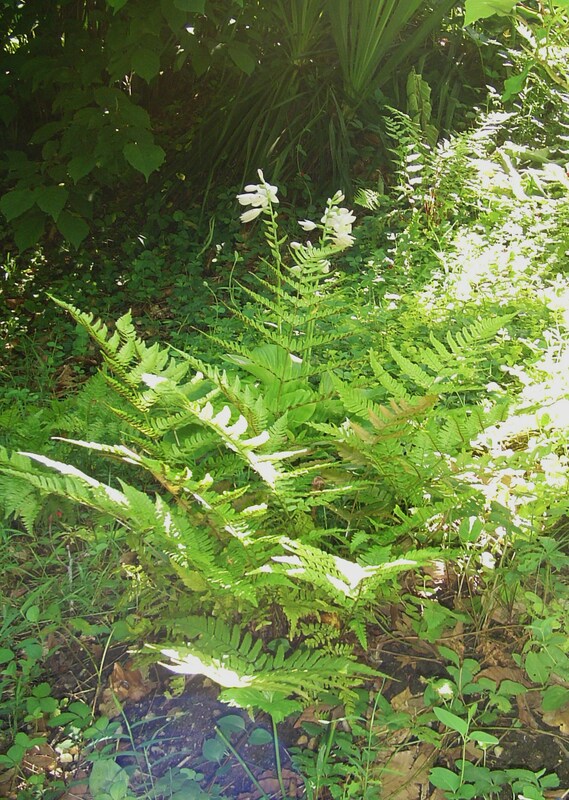 The gardener seeks balance between the old and the new, adding new plants gently into the existing forest community. With that in mind, it is wise to add plants that will live more than a season, plants with strong roots that will branch out and seek their own spaces and sustenance. The essence of “perma-culture” is based on this idea of introducing useful plants who will dig in, find their own way, live indefinitely, and provide an on-going benefit to the gardener. 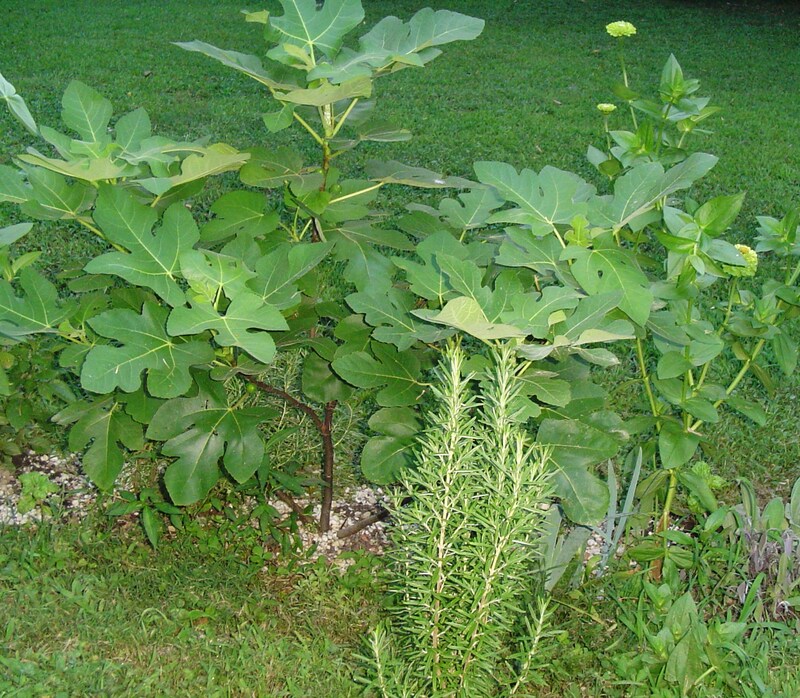 A newly planted fig tree is surrounded by Rosemary and Iris. Planted once, these will grow happily here for years. The most obvious choice, if there is space and sunlight, is a fruit or nut bearing tree. A tree which is beautiful, adds to the landscape, and produces a useful crop is a good investment. Care must be taken to give each new plant the space it needs to mature and get adequate sunlight. In the tropics, trees produce staples such as coconuts, dates, breadfruit, mangoes, papayas, and avocados. These crops are reliable year after year and provide a steady food source. 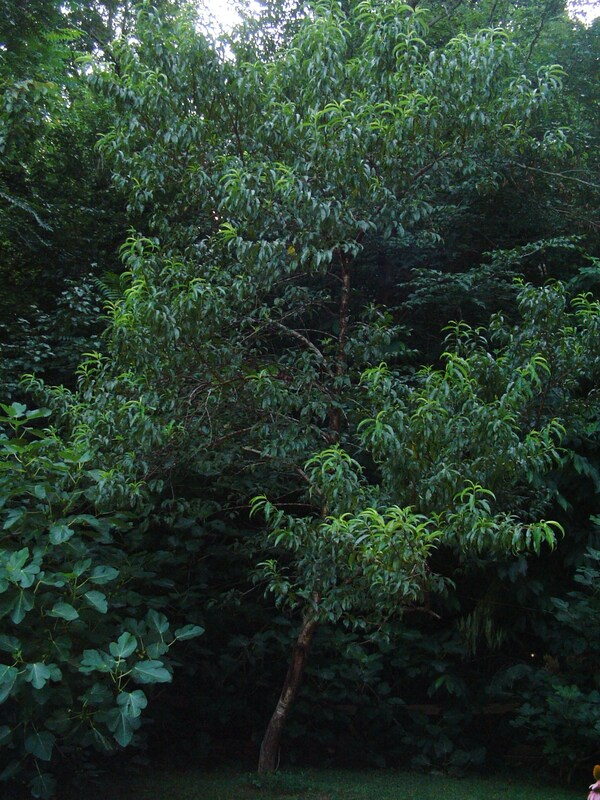 In Zone 7b, there is still a wide range trees to plant in a forest garden which produce a reliable edible crop. For an initial investment of $10.00 to $30.00, healthy, well grown trees can be purchased either bare-root or in pots. Most will produce a first crop within 1-3 years of planting, depending on the variety and maturity of the sapling. Good choices include fig, apple, pear, peach, pomegranate, persimmon, plum, paw-paw, cherry, pecan, walnut, hazelnut, and hickory. A peach tree grows in the edge of the forest. Orange, lemon, and grapefruit trees are hardy further south, but can be grown in large pots and kept inside during the coldest months in winter. Banana trees can similarly be grown outside in summer, dug and stored inside in winter. Choose varieties carefully, as fruit trees often require a companion of another variety for cross-pollination. While some of these trees, like fig, will produce a crop with minimal care, others, like apples and peaches, do require spraying. All benefit from an annual gift of finished compost sprinkled around their roots. The biggest problem I’ve experienced is loss to birds and squirrels, which begin attacking the fruit long before it is ripe. Netting offers some protection. 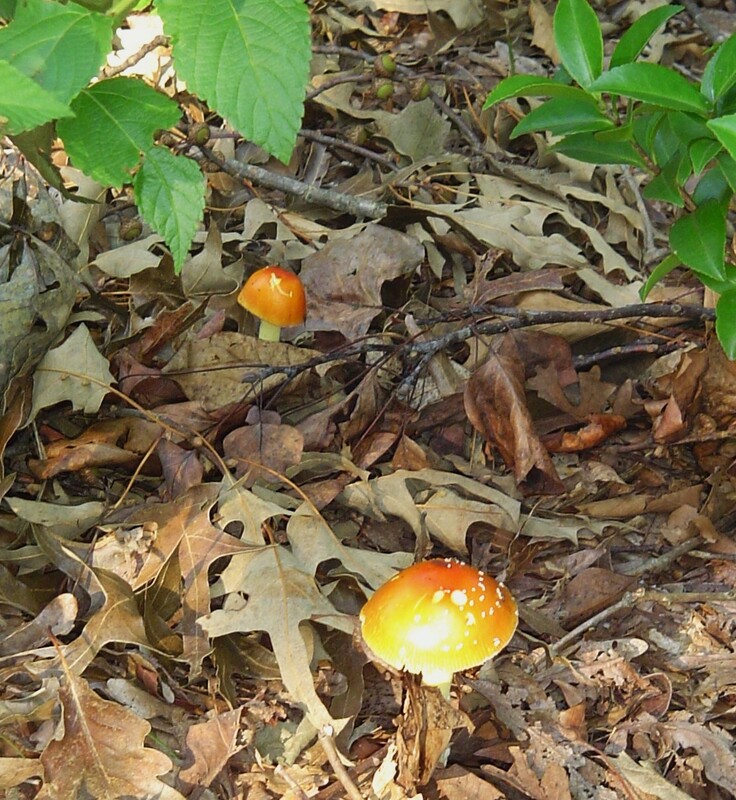 A forest grows in layers, and many understory shrubs also produce fruit while thriving in partial shade. Cherries, blackberries, raspberries, blueberries, gooseberries, and currants can be planted in full sun or partial shade. Many of these can also live permanently in large pots. Vining crops such as grapes and kiwi can be grown on pergolas or trellises in patches of sun. Most of these need a male and a female plant for fruit production, but cover large areas with beautiful vines which also provide shade. A raised bed garden with herbs, perennials, peppers, and tomatoes. 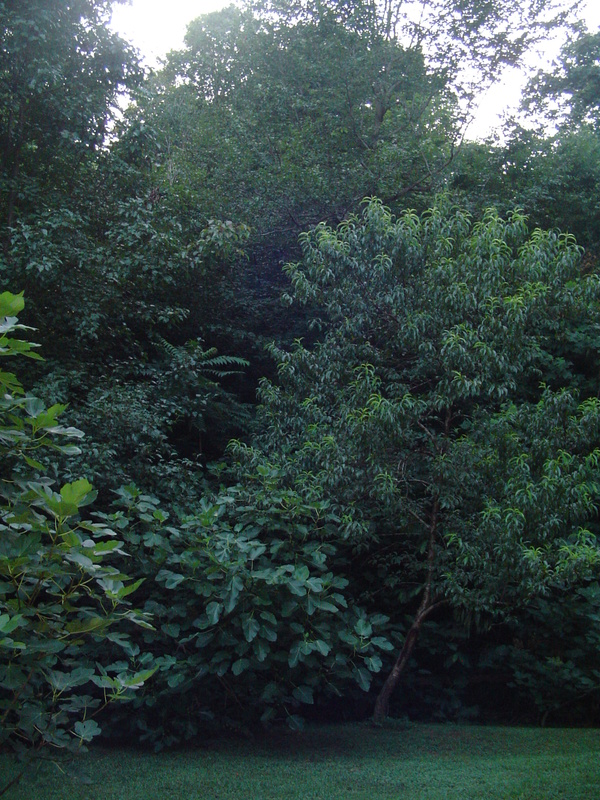 Peaches and figs grow along the edge of the forest where they get some sun. These were badly broken two summer’s ago when a neighbor’s oak fell across the yard, destroying my orchard. These trees have managed to recover. Finally, if there is space for a raised bed in a sunny spot, crops like asparagus, rhubarb, running onions, and Jerusalem artichoke bear for many years after planting and offer a reliable crop with little labor. Perennial herbs, like Comfrey, Rosemary, Sage, Lavender, Oregano, Marjoram, Chives, Bay, Thyme, Monarda, and Mint will come back bigger and better each year. 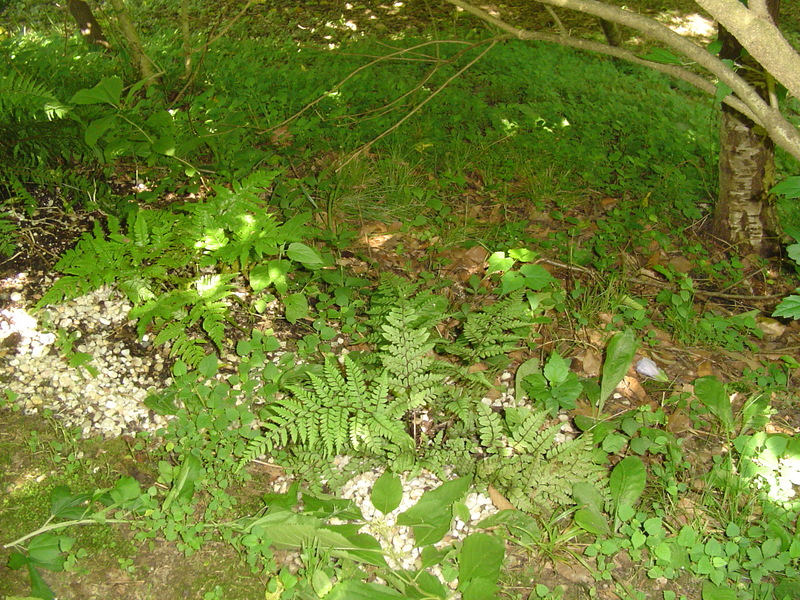 This is an understatement in the case of mints, which grow aggressively by underground stems and can become invasive. They are best planted where they can spread without harming other crops. Pineapple mint and “Otto Quast” Lavender grow on a sunny bank. Rosemary, Sage, Thyme, Bay, and some Lavender remain evergreen in zone 7b and south and can be harvested for cooking all winter. Weeding, watering during dry spells, an annual topdressing of compost, and careful harvesting after the plants are established sums up the needed maintenance. Some crops will need more protection from hungry wild life than others. Crops like asparagus and rhubarb should be allowed to grow for at least 2 summers before any harvest. 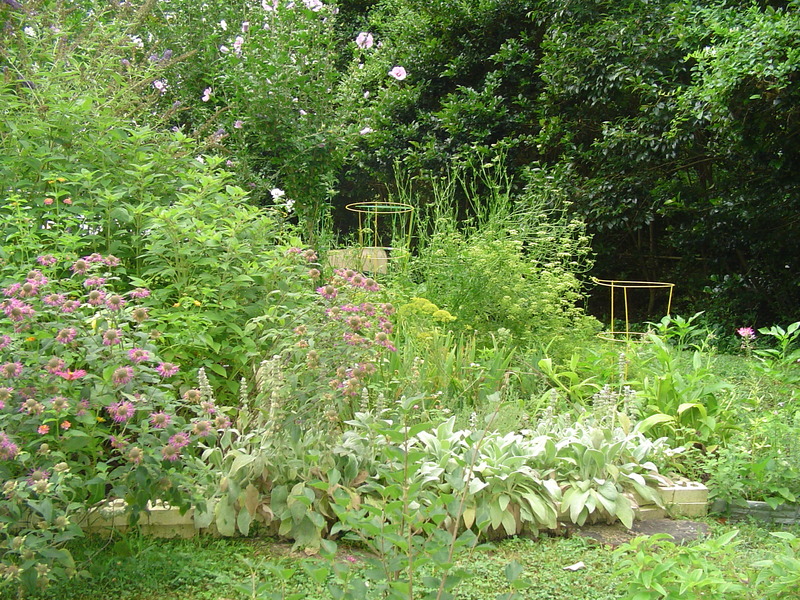 If space is left in the raised bed for annual herbs and flowers, any harmful insects will mostly get eaten up by birds or other insects. 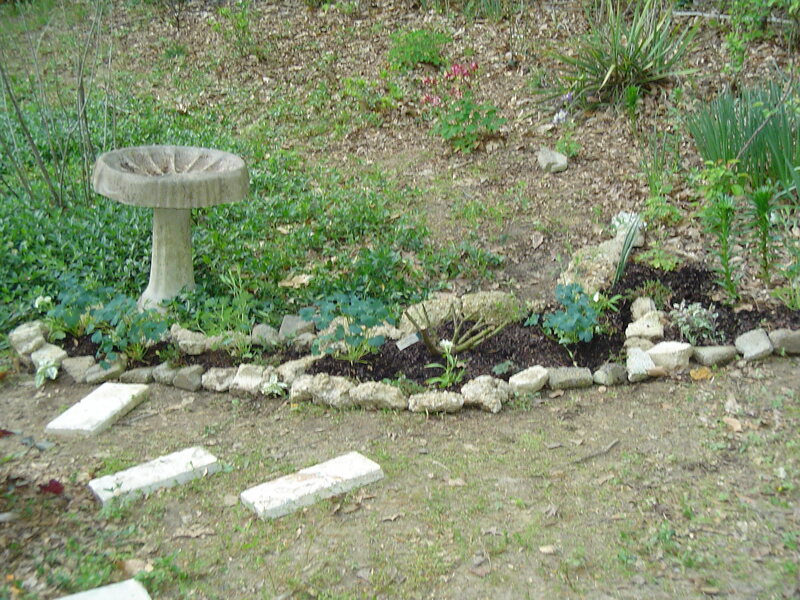 This raised bed garden is edged with chunks of rock and cement. Raised beds can be built from a variety of materials, including bricks, stones, hay bales, fallen branches, logs, and the prunings from trees. A method of building raised beds, pioneered in Europe, actually begins the bed with a thick layer of logs, branches, and leaves. 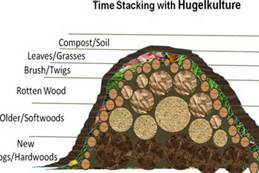 Similar to sheet composting, this layer of wood is expected to break down slowly over several years. It absorbs available water from rain and watering, holds the moisture like a sponge, and releases it to thirsty roots as needed. The wood is covered with leaves and grass clippings, along with other compostable materials, and finally topped with two to three inches of topsoil or finished compost. 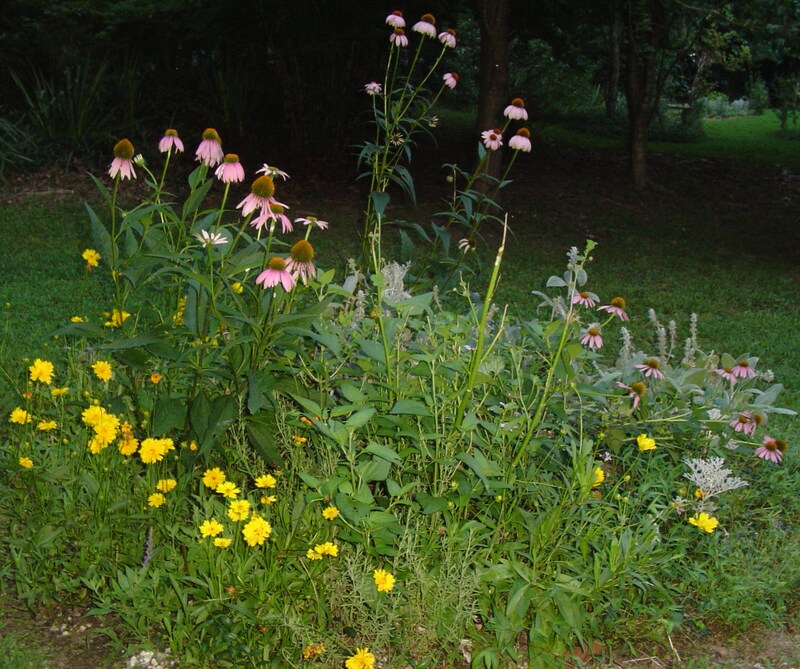 The bed can be allowed to settle or season, or can be planted immediately in pockets of deeper soil. The building materials slowly decompose into compost, making the soil richer and deeper each year. This Hugelkultur method, (http://www.diynatural.com/hugelkultur-raised-garden-beds/) is the ultimate form of recycling in the garden. Leaves, grass clippings, branches, and fallen trees can be used in building beautiful raised beds which bear abundant crops for many years. This stump garden is into is third summer. 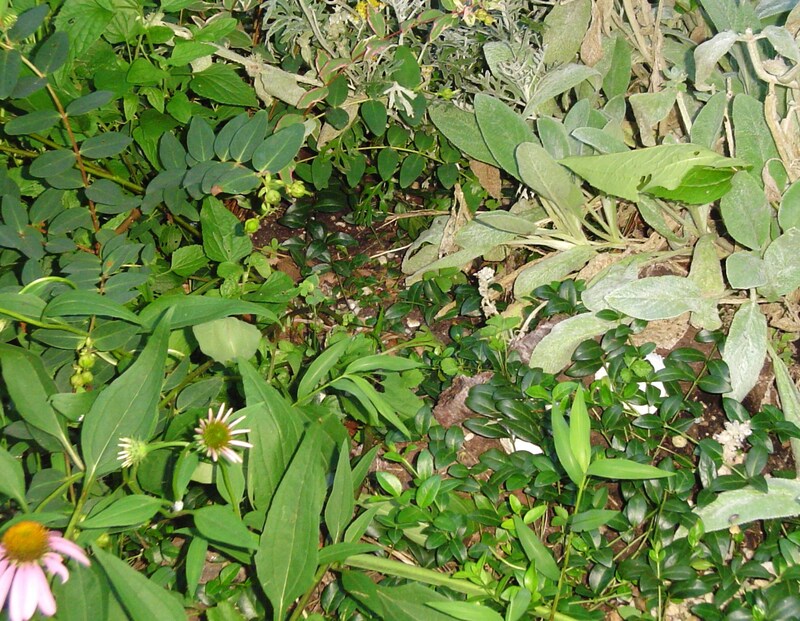 A Camellia shrub is planted near the center, protected from grazing by Echinacea, Coreopsis, Stachys Byzantina, Vinca, Sage, and Sedum and St. John’s Wort. A variation of this method is my “stump garden”. My garden is dotted with large stumps from a former owner’s efforts to remove large trees near the house after Hurricane Isabelle, and smaller stumps left from where a neighbor’s oak fell across my orchard during Hurricane Irene. Each of these stumps has become the nucleus around which I’ve built a raised bed. The stump which serves as the nucleus of this garden is still just visible in the center of the bed. 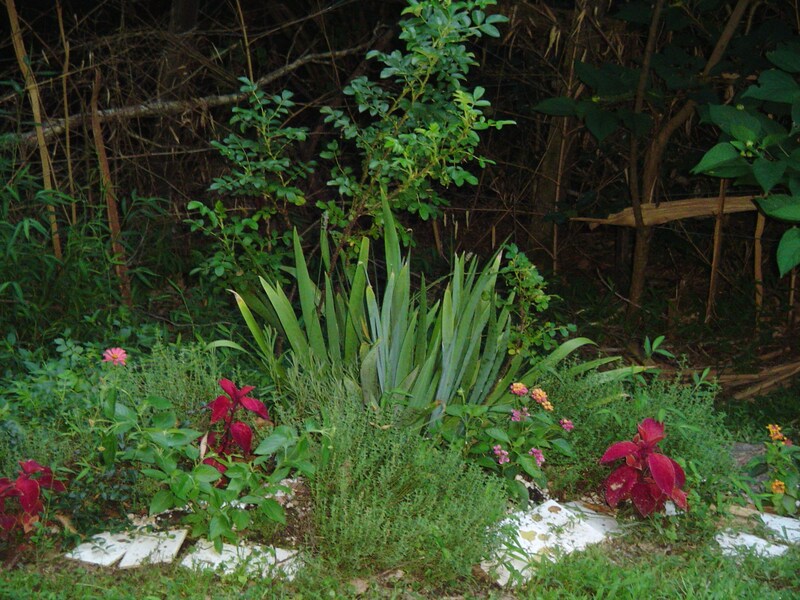 Compost was spread around the stump, and then plants were added each season in an ever widening circle. The method is simple. I spread a few inches of finished compost around the stump, and plant. 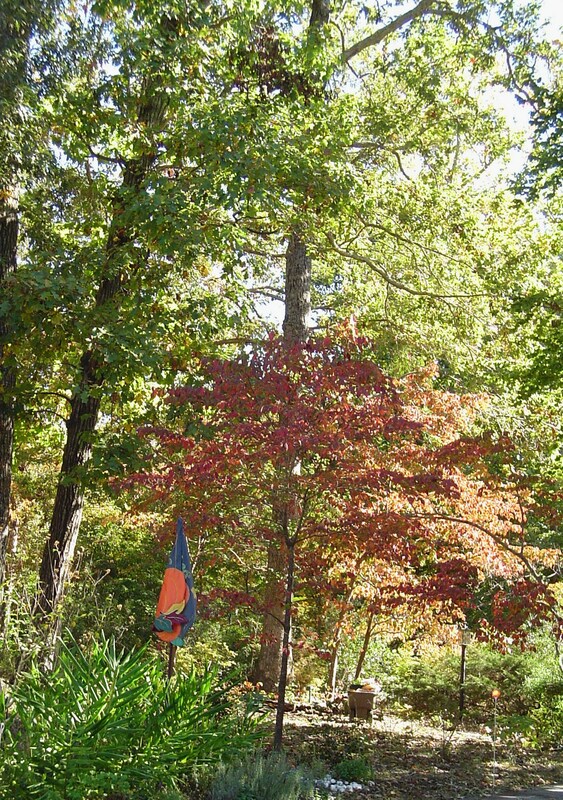 The stump breaks down in the center of the bed; holding moisture; providing food and cover for the worms and insects who enrich the soil; and initially creating a focal point. Eventually the plants grow up higher than the stump, and it disappears as it returns to the Earth. I’ve also used this method for recycling the still living contents of pots when time comes to plant for a new season. Plants and their soil can be emptied and “replanted” around stumps, or in depressions in the ground which need filling. The plant, if perennial will continue to grow, sinking its roots ever deeper. If an annual, the roots and soil remain after the plant itself dies back. Over several seasons, this builds into a new planting bed. These ferns grew in pots last summer, but died back over the winter. They were planted along the edge of a bank in depressions to help hold the bank against erosion. I normally plant shallowly to avoid established roots. In other words, I dig a small hole for the new plant, usually only deep enough to accommodate half to three-quarters of the depth of the root ball. Often the roots of the new plant can be untangled a bit and spread out to cover more space but use less depth. I settle the root ball into the new hole, and then mound compost around the root ball to cover it. Rosemary can be harvested year round. 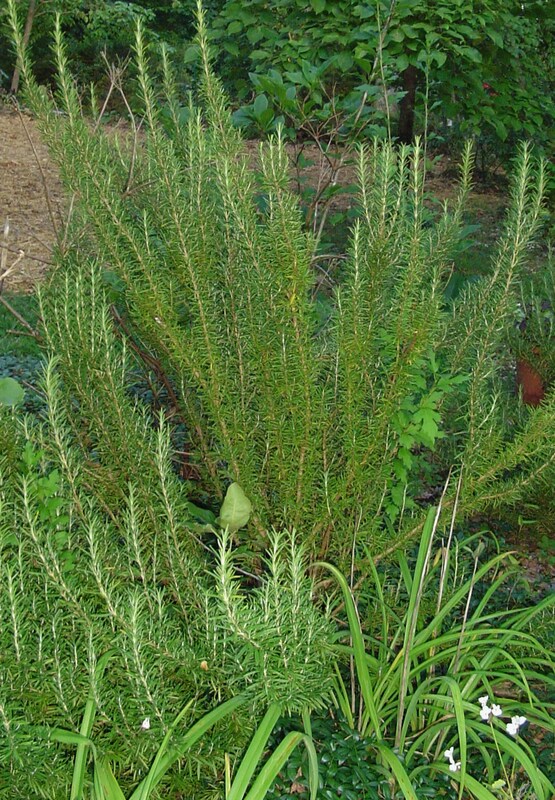 It is evergreen, and has small blue flowers in late winter. 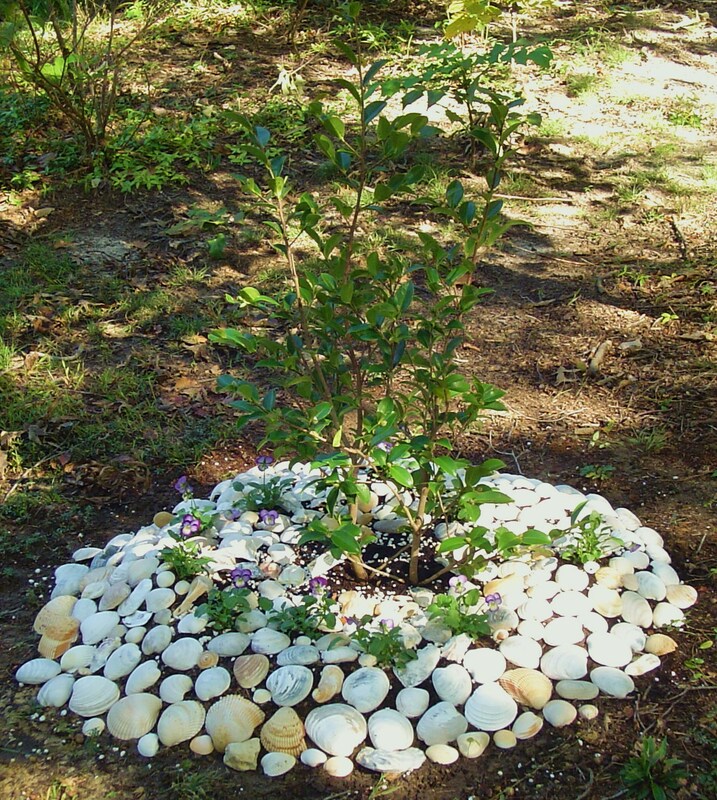 A newly planted Camellia, surrounded by compost. Violas and sea shells will help hold the compost in place as the shrub grows. When planting into a new raised bed, the entire bed is covered in several inches of compost so the top of the new bed is level after planting. When planting a specimen shrub, like a camellia, the compost around the root ball is extended out a foot or more from the trunk, and can be planted with bulbs, ferns, and small annuals to hold the compost in place as the shrub gets established. 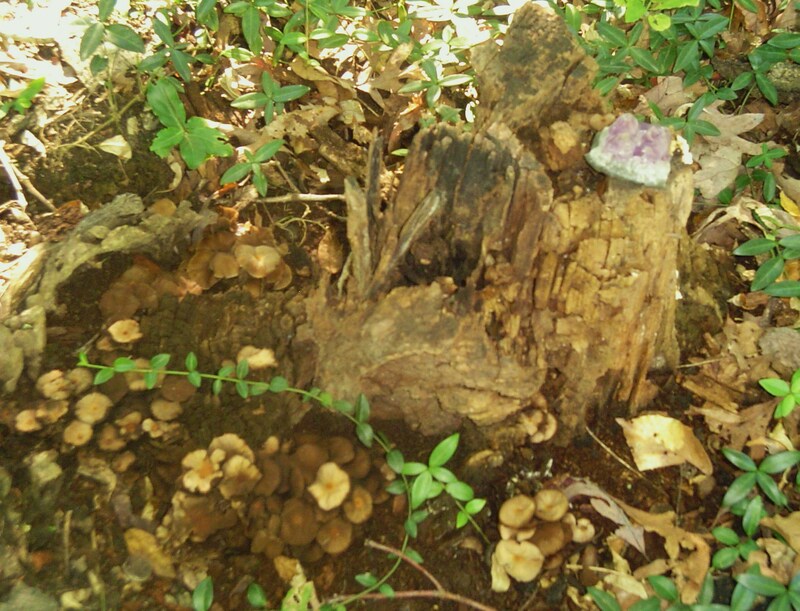 Perma-culture is an economical, sustainable approach to gardening in a forest. Fruit and nut trees, berry bushes, and fruiting vines not only produce an edible crop, but are beautiful “bones” in the landscape. They attract all sorts of wildlife, including beautiful butterflies, and bees. They offer a food source for wild bees and other nectar seekers. 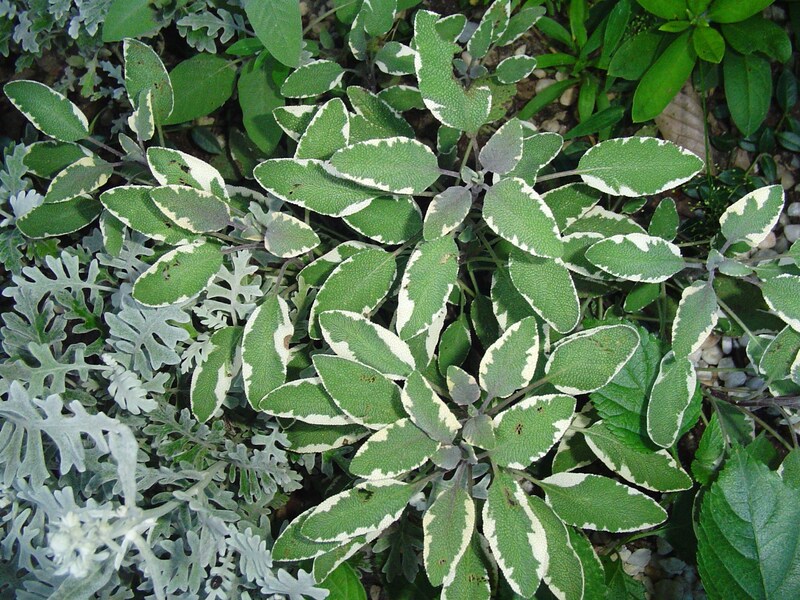 Tri-colored sage is a tender perennial which usually survives the winter in Zone 7b. Of course, “perma-culture” can be practiced as easily with ornamental plants as with food producing ones. New trees and shrubs don’t need to produce an edible crop to provide beauty and stabilize the soil. Raised beds can be planted with perennials, ornamental shrubs, ferns, and herbs which aren’t intended to end up on the dinner table. This approach requires less labor from the gardener, and more watchful appreciation. We do less digging, and more “helping along”. An initial investment pays off over many years. The harvest, once it comes, is reliable, and grows more abundant year after year. We have food for ourselves, food to store, and food to share with friends and loved ones. UPDATE: Since initially posting this article, I found a reference in something I was reading online to a recently published book on Perma Culture by Rick Austin called, Secret Garden of Survival. Mr. Austin’s book is full of interesting ideas and useful tips, and I recommend it to anyone wanting to explore Perma Culture in more depth. His approach is very different from mine. He appears to be living in a wooded rural area in the mountains somewhere on the east coast of the United States, and wants a sustainable food supply on his own property which is camouflaged from visitors. I am living in a suburban neighborhood, on an established property, with close neighbors. Mr. Austin clear cut a portion of his land and brought in heavy equipment to build terraces, a water filtration system, and a large pond stocked with fish. He is raising small animals for meat, keeping bees, and growing a huge variety of food. His goal is to grow and preserve all the food his family needs. This entire process is explained and illustrated in the book. While I am not re-configuring my land or trying to create a survival garden hidden away from the world, I found lots of useful ideas for protecting plants from hungry animals and for companion planting. Mr. Austin illustrates how grapes grown up fruit trees grow much more strongly and bear better than grapes grown on fences and trellises. He uses blackberry bushes as a fence to protect his garden, and offers many useful suggestions for organic gardening and companion planting. His system of planting circular gardens in concentric rights around fruit and nut trees is a fresh approach to companion planting. These “guilds” of plants include both perennials and annual crops, trees, shrubs, vines, root crops, herbs, and vegetables. I appreciate Mr. Austin’s reflection on the nature of “weeds” as the closest of any author’s to my own, and I appreciate his courage to publish the truth. This is a short book, but is packed with information, useful illustrations, and the sort of wisdom only born of hands on experience.